Is the New Amsterdam Theatre Haunted? 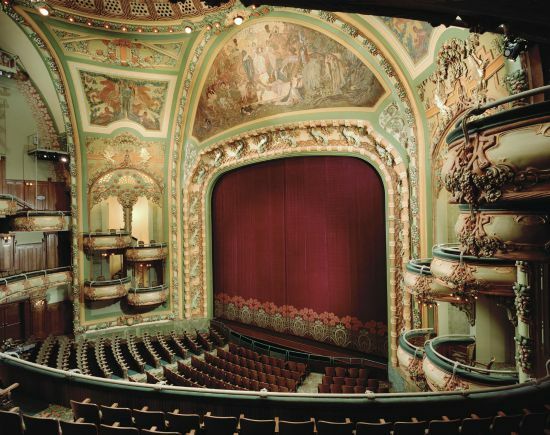 The New Amsterdam Theatre was built in 1903 by architectural firm Henry Hertz and Hugh Tallant. The same architects added a roof garden the next year for the theatres more risqué performances, though very few were ever shown in this area. The rest of the building apart from the top was used for offices, and from 1913 to 1927 the building was owned by the company Ziegfeld Follies, who's producer had an office in the building and the roof garden was converted into a nightclub. The Theatre has been home to some classics in its time, with Eva LeGallienne's civic repertory theatre and George Whites scandals being subsequent owners. But all this didn't begin until 1937, when the building was renovated and officially opened as a theatre, only maintaining a few offices in the top of the building for whichever production company owned it at the time. It closed as a theatre in 1985, and was leased to the Walt Disney Company the same year, though they did nothing with it until 1995, when it was renovated and became a flagship theatre for "Disney Theatrical Production presentation on Broadway". Today the theatre is still open as such and hosts a huge array of Broadway performances. There is thought to be only one ghost that haunts the theatre, and it is that of a past actress named Olive Thomas. The story goes that on September 10th, 1920 she and her husband Jack were on holiday in Paris, when she found some pills prescribed to her husband in the bathroom. She took some thinking they were obviously something else, but they were mercury bichloride pills and the amount she took proved to be lethal, which probably wasn't a lot since mercury is very poisonous. Although she died in Paris it seems she has returned to haunt the place she so loved in life, and there are a huge amount of claims of seeing here. Guests and security guards alike have reported seeing her walking throughout the halls of the theatre, always holding a bottle of blue pills. She seems to appear more often to men than women for some reason and is often described as having a rather friendly aura.